SLAVUTYCH, Ukraine -- Ukrainians Sunday marked 29 years since the Chernobyl nuclear disaster, laying wreaths and candles near the plant where work to lay a new seal over the reactor site has been delayed. 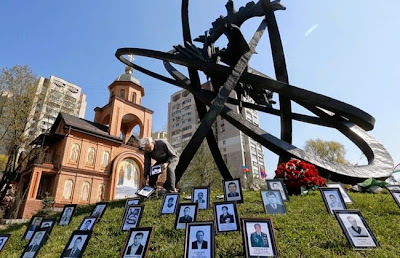 A relative of a Chernobyl victim places a photo near the monument erected in memory of the victims of the Chernobyl explosion in Ukraine's capital Kiev, Ukraine, Sunday, April 26, 2015. The explosion of reactor number four on April 26, 1986, spewed poisonous radiation over large parts of Europe, particularly Ukraine, Belarus and Russia. At 1:23 am, the exact time of the explosion, hundreds of people placed flowers and candles in the dark at the foot of a monument in Slavutych, a town 50 kilometrers (30 miles) from the plant. Slavutych was built to rehouse Chernobyl workers who had lived near the plant and were forced to move further away after the disaster. At the site of the plant itself, around 100 kilometres from Kiev, Ukraine's President Poroshenko laid a wreath on Sunday at a monument to the victims. But environmental group Greenpeace predicted that there would be around 100,000 additional cancer deaths caused by the disaster. They hastily laid over the reactor site a concrete cover dubbed "the sarcophagus", which is now cracking and must be replaced. Poroshenko on Sunday inspected ongoing work to lay a new 20,000-tonne steel cover - a project estimated to cost more than two billion euros ($2.2 billion). The structure will contain technology that will act beneath the cover to decontaminate the area once the steel layer is in place. Poroshenko said the new cover would "protect forever" against radiation from the site. The work had been scheduled for completion by the end of this year but the EBRD said last year technical problems would delay it until late 2017.